Corn bird food such as dried whole kernel corn will attract larger birds and the easier to eat cracked corn will attract additional smaller-sized birds and is best offered in ground-feeders. Mourning doves especially like to eat cracked corn dispensed on the ground. Containing both protein and fiber, cracked corn is a great addition to a bird's diet. This is a little extreme, but here are birds eating from a giant tree of corn. 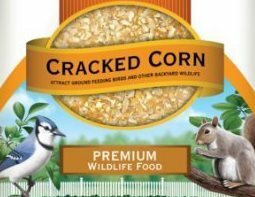 Cracked corn is also an ingredient used in wild bird seed mixes which most birds will eat after the preferable seed is gone. Corn is a cheap alternative for attracting pheasants, quail and doves. 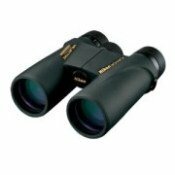 But if you start getting too many blackbirds, cowbirds and/or house sparrows, you may want to eliminate corn from your wild bird food offerings. Unfortunately, or fortunately depending on your point of view, squirrel love corn too. So if you have squirrels in your neighborhood, expect them to show up at your corn feeder. 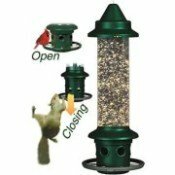 You can always give them their own station or squirrel feeder like the one in the video below so the bird feeder won't be stolen from as much.